Sister Moireen Kelly, 96, a founder of the Benedictine Sisters of Annunciation Monastery, Bismarck, entered eternal life Wednesday, Oct. 20, 2010, at a Bismarck care center. 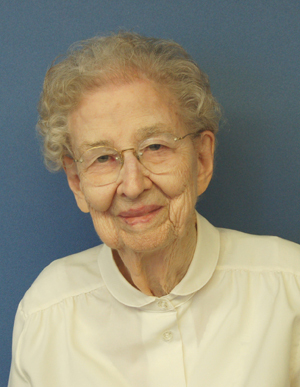 God and music were woven throughout Sister Moireen’s 75 years as a Benedictine Sister. She dedicated her life to God and spent many years teaching and enjoying music. Born on Sept. 10, 1914, in Mandan, N.D., to John and Rose (Boehm) Kelly, Sister Moireen was given the name Gertrude. She was the oldest of six children, five girls and one boy. While in the fifth grade, Gertrude met the Benedictine sisters from St. Benedict’s, St. Joseph, Minn. During weekend walks with the sisters, she recalled asking them many questions which led to her own interest in religious life. She entered St. Benedict’s Monastery in 1933, where she received the name, Sister Moireen, and made monastic profession July 11, 1935. Sister Moireen’s major in music eventually led to her ministry as a music teacher, choir director and organist. In 1938, she was sent to the Bismarck Diocese where she taught music in schools, directed choirs in parishes, and gave private piano lessons. In 1947, Sister Moireen earned her Bachelor of Arts degree from the College of St. Benedict. That same year, Sister Moireen transferred her commitment to the Benedictine Sisters of Annunciation Monastery when sisters were invited to found a new community in the Bismarck Diocese. She served in music ministry throughout North Dakota at St. Mary’s in Bismarck; St. Joseph’s Convent, Mandan, and at St. Patrick’s Convent in Dickinson. She continued as a music instructor and private piano instructor for 31 years at Annunciation Monastery and the University of Mary, where she was a faculty member for 15 years. She also served the monastic community as organist until her retirement in 2007. She will be fondly remembered for her ability to tell a good story, her faithfulness to the Benedictine life and her love of family, friends and community. Sister Moireen is survived by a sister, Kathleen Kennedy, Billings, Mont. ; a brother, John (Maureen), Roseville, Minn.; a brother-in law, John Maillet, Missoula, Mont., nieces and nephews, their children and the Sisters of Annunciation Monastery. Today we gather to celebrate and give God thanks for gifting us with Sister Moireen for 96 years, 75 of those years as a Benedictine Sister. We remember her with much love and gratitude. She was not only one of the founding members of Annunciation Monastery, but also was remarkably faithful to the Benedictine way of life. She was always there – present for community prayer, for meals, for community gatherings. She dedicated her life to God through the monastic way of life and gave it everything she could. Like many of our elders, even into her 90s, Sister Moireen maintained a staunch interest and loyalty to community members and the mission of Annunciation Monastery. Her steadfast faith and commitment to God, to our monastic community and to the people of the Bismarck Diocese continues to inspire us. Another of her outstanding qualities was her unwavering obedience to what was asked of her. We all know she loved music and enjoyed teaching it. From 1938 to 1959, she taught music in schools, directed choirs in parishes and gave private piano lessons in Bismarck, Mandan and Dickinson. She also delighted in getting to know the people in those cities. Sister Moireen often told a story about a particular point in her life when she was asked to do something that she did not expect. She was at St Patrick’s Convent in Dickinson when a telephone call came from Mother Edane. Sister Moireen was asked to come to the new monastery in Bismarck and serve as the community’s procurator. As Sister Moireen tells the story – she said to Mother Edane that she would much rather prefer to stay in Dickinson and teach music. However, Sister Moireen was on the next train to Bismarck. She was 45 at the time and walked into a new world of overseeing purchasing, maintenance, transportation and the distribution of clothing for over 200 sisters. It was a position she held for ten years. This is a prime example of the personal sacrifices Sister Moireen made, to do what she could to help the community. Sister Moireen was also one of our musicians and organists. There were many days and many years when she would faithfully climb onto the organ bench and play for prayers. She enjoyed contributing to the musical aspect of our prayer. She did rejoice in the Lord and exulted in God’s presence by making beautiful music. Sister Moireen always enjoyed a good visit with people. She especially looked forward to visits with her family. She talked about all of you with such love and affection and was so proud of her nieces and nephews and their children. Kathleen, having you and other family members here last summer for her 75th jubilee filled her with much joy. I think she was on cloud nine for weeks after that special day. It is wonderful memories like these that all of us have of Sister Moireen which do not end with her death. They live on in our hearts and give us comfort. Through the grace of baptism Sister Moireen became a child of God and was endowed with a faith that grew stronger and deeper as the years went by. Today’s responsorial psalm is very fitting for this faithful Benedictine woman who longed to live in the house of the Lord all the days of her life. As the response says, “I believe that I will see the good things of the Lord in the land of the living.” So we believe – believe that Sister Moireen now dwells in the land of the living, making beautiful music in the house of the Lord forever. God bless you Sister Moireen. We are so grateful that God gifted us with your presence, love, and powerful witness of faith. Sister Moireen Kelly lived the life of a Benedictine sister with a spirit of whole-hearted love and joy. Born in Mandan, North Dakota, to parents of German/Irish descent, the young Gertrude quickly learned to tell time by the arrival and departure of the trains. Her father was a railroader with Northern Pacific, while her mother saw to the comings and goings of her eldest daughter, to include piano lessons. Shaped by the Catholic practices of her family and the influence of her teachers, Sisters from St. Benedict's Monastery in St. Joseph, Minnesota, Sister Moireen, in 1933, left her family, then living in Livingston, Montana, to begin her life as a Benedictine Sister. At the outset, she trusted that her call to community was of God. She knew that obedience was more than a matter of rules. It was listening, listening with the spirit to God's Word, to the Word made flesh. There's an Irish proverb that says, "Continual cheerfulness is a sign of wisdom." In Sister Moireen's case, her cheerfulness was also a sign of her ability to tell a story. One of her stories put the spotlight on her father and his strong objection to her becoming a religious. In fact, one day he appeared at the convent unannounced to take her home. A year later at her reception, Mr. Kelly was proudly taking all the credit for his daughter's decision to become a Benedictine. Becoming a Benedictine is embarking on a search for God in the company of others with the same desire, the same voice, and the same wonder and joy. This evening's reading from Sirach captures the essence of Benedictines' unending round of worship from hour to hour, year to year. "Sing a song of praise blessing the Lord for all his works. sing with all your heart and voice..."
Substitute piano and organ for lyre and you begin to sketch the profile of Sister Moireen, piano teacher and performer, church organist, choir director, classroom music teacher, faculty member, and until her retirement in 2007, monastery organist. She enjoyed it all because the medium of music connected her to people and the community. She was held in great respect by the piano teachers across the state and was an active member of local, state, and national music teacher associations. Her musical gifts were never confined to meeting her own needs. She spent her life creating a world of music and text that resonated in the hearts of those she served. With a facility for relating with students of all ages, Sister Moireen could transform an ordinary piano lesson or a regular choir rehearsal into an experience in which the participants at the end would say, "Let's do it again!" In the words of Ignatius of Antioch, we could hear Sister Moireen say, "Take the tone altogether from God, and sing aloud to the Creator with one voice through Jesus Christ, so that he may hear you and know by your good works that you are indeed members of Christ's Body." Sister Moireen's good works, were expanded with the move in 1959 to the new priory and school when Mother Edane asked her to serve as procurator and director of choirs at the new Priory High School. The ten years as procurator not only made her a student of Chapter 31 of the Rule of St. Benedict which described the procurator as "someone who is wise, mature in conduct, temperate," but, 40 years later, she journaled about another move -- the move to this monastery. She wrote, "The chapel pews had our name labels in our places as well as our prayer books. Now isn't that detail?! I knew then our prayer schedule was in place and life in the new Annunciation Monastery began in earnest!" For Sister Moireen, "Ora et Labora," prayer and work, summed up the life of a Benedictine, that is, if you added the game of bridge. She and my mother tried to be subtle about their passion for the game. You'd hear them talk about mission, couples, foursome. We all knew it was bridge! As a young Sister, when Latin was still the language of worship, Sister Moireen had an awakening to God's great kindness. In Psalm 18 she met God as her rock, her savior, her shelter, her light, her life. She shared with another Sister, "He's more than a judge." And when it came to make a judgment on the level of care Sister Moireen needed in her last days, she herself, much to everyone's surprise, showed up at her own care conference and announced that she'd like to participate in therapy for another week. But, she added, if she were to go home to the monastery, she would never want her needs to keep a Sister caregiver from community prayer or gatherings. Community was life-giving to Sister Moireen, because she gave her life to this community. On her 75th Jubilee she celebrated in the presence of family. Nothing meant more to Sister Moireen through her years than time spent with her family, her friends, and community. On that occasion she said, "Everyday, to the best of my ability, I try to do ordinary things extraordinarily well." So now, Sister Moireen, sing with all your heart and voice, for you have done all things extraordinarily well.